"I may curse like a sailor and have a shaved head, but I'm a pretty good role model, I promise!" Following the crazy events of CMJ, I spent last Monday night (a week ago -- it feels like eons ago!) 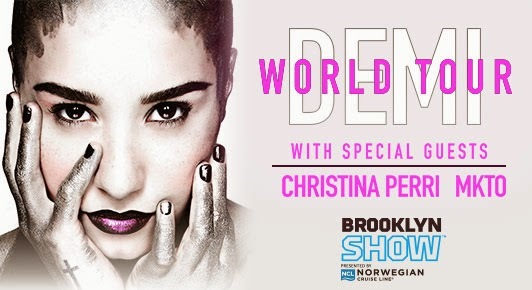 at the Barclays Center with today's youth (I mean...) to catch what was actually the final date of Demi Lovato's DEMI WORLD TOUR (in North America), her second tour run in support of her latest record, DEMI. This is my second time seeing Demi perform live -- the first being back when she was just starting out promoting her then not even released debut album as the opening act for the Jonas Brothers on their Burnin' Up live concert tour. It should be noted that this is my second major tour show to see at the Barclays Center (the first being Cher/Cyndi Lauper) and it's easily beating out the other super-large venue in my general vicinity - Madison Square Garden - simply because it's much closer to my actual apartment and I feel like it might be slightly smaller. No matter if that was the case or not, I had fab seats so I'm definitely not complaining! Unlike most major show events, this one started right on time (it's almost unheard of, right?). MKTO hopped on stage first -- a energetic duo of hip-pop featuring two former Nickelodeon kids. The vocal half, Tony Oller, actually co-starred with Demi Lovato on the short-lived short Disney series As the Bell Rings back in 2007. The crowd was still filtering in during their set but it got loud and rowdy during their final song, the summer single "Classic". Let me tell you -- it's a bit weird when you're surrounded by mostly chicks in their teen-years singing along to "Let's get it on like Marvin Gaye / Like Hathaway, I'll write a song for you like this." But it's still a jam, though. Following MKTO, the set was immediately striked and a handful of commercial-like shorts featuring Demi were cued up on the screens. However, the crowd had only minutes to wait before the lights went down again and Christina Perri jumped onto her piano surrounded by low faux-candlelight to belt out "Jar of Hearts". I knew very little about Ms. Perri before the show, but whether or not you love her music, she is so utterly likeable. She was pure charisma and sweetness and the crowd literally adored her, singing along to almost every song. Christina had the longest set of the three opening acts and was quickly followed by Spencer West, a motivational speaker who lost both of his legs at age 5 and has yet climbed Mount Kilimanjaro. He kept re-iterating the lyrics of the chorus from Lovato's album cut "Warrior", stating, "Now, I'm a Warrior / Now I've got thicker skin / I'm a Warrior / I'm stronger than I've ever been / And my armor is made of steel / You can't get in / I'm a Warrior / And you can never hurt me again." He also spoke of how he first met Demi when the two traveled to Kenya on a mission to help women and to build schools for young people. This theme of inspiration was central to much of Demi's set. After Spencer, Kiesza, accompanied by a DJ and a handful of dancers, came out dancing to a short set featuring just her singles in "No Enemiez", "Giant In My Heart" and "Hideaway". She was the opening act I was super pumped for so I was really let down that the crowd was not all about her -- perhaps their just too young to appreciate her 90's pastiche. It wasn't until "Hideaway" was cued up that she gained any real crowd traction (save for myself and a handful of other adults who were up dancing for her entire set). "Giant In My Heart" included dance samples of Bell Biv Devoe's "Poison" (it's literally everyone's favorite song to sample these days!) and Rob Base's "It Takes Two". Let me say this -- as good as she sounds recorded, she sounds so much better live. If you haven't checked out her album, Sound of A Woman, you need to. Like right now. There was only 15 minutes or so to wait before a green-haired Demi Lovato took to the stage wearing a leather jacket and a shiny, silver, armor-inspired corset top, flanked by a troupe of dancers to the tune of her latest single, "Really Don't Care." A lot of her set was predictably from her latest album, DEMI, including soulful ballads like "Nightingale" and the aforementioned "Warrior". This was balanced by her rock-influenced uptempos that show off the full range of her strong voice like "Fire Starter". Popular jams from her sophomore set, Here We Go Again, also helped beef up her uptempo material in "Got Dynamite" and "Remember December". The first real highlight was when she grabbed her guitar and belted out an acoustic version of the ace and underappreciated "Don't Forget" from her debut album. This was followed -- by fan request -- with an acoustic version of her debut single "Get Back". With a twinkle in her eye, following her acoustic set up, she states she's about to perform a song she hasn't performed live in years, just for Brooklyn. As the opening chords for "Wouldn't Change A Thing" (the love duet from Camp Rock 2 with her on-screen/off-screen-ex beau) are heard, it felt like the entire crowd was holding their breath and then Joe Jonas himself walked on stage to sing with her. For those of you who are thinking the JoBro appeal is a done deal, think again -- it legit felt like an earthquake when that boy walked on stage. The duet was over in a blink of an eye. The two hugged and that was that. Demi also pulled out a pretty fab cover of Michael Jackson's "Thriller" (complete with choreography!) before chirping "Happy Halloween". She closed her set with a one-two punch of "Skyscraper" (and yes, I did get teary eyed and I'm not ashamed) and "Give Your Heart A Break", before trading her outfit for a different metallic corset for her final jam "Neon Lights". Prior singles "Here We Go Again", "La La Land", and "Made in the U.S.A." were nowhere to be found. Overall, I give Demi so much props -- not just for her vocal talent, but for her ardent desire to mobilize her young demographic (rather demi-graphic...no? Not funny?) toward positivity and charitable works. As she said herself, she cannot move forward by constantly rehashing the past and this tour is a move in the direction of practicing the goodwill that she preaches and continuing onward with her now healthy, happy lifestyle. That type of honesty and realness with the public is rare, not just in the teen pop realm but in the larger pop community itself. A+, indeed.